Since 1980, I’ve been speaking full time and have been proudly represented by the finest bureaus. 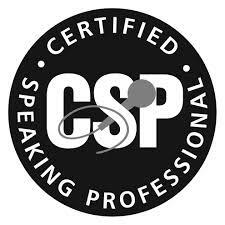 I’m a CSP and have also been inducted into NSA’s “Speaker Hall of Fame”. I endorse and uphold the International Association of Speakers Bureaus “Code of Ethics.” I adhere strictly to “spin-off” standards and honor your relationships with your clients. how to partner with you to mutually delight your clients. Co-brokering is not necessary as I am not exclusive with any one bureau. If your bureau is not a member of IASB, please do not represent me without my specific written permission. Wherever I am in the world, I’m accessible to you via email, phone (425-255-2900) or the Contact form here on my website. Microsoft, Ford, Johnson & Johnson, FTD, Washington Mutual, American Express, Starbucks, Hewlett-Packard, GE, American Airlines, AT&T, Dunhill, Roman Meal, Washington Mutual, Nikon, and many other associations and corporations.